Well, I've been asked several times if I made a template as I went along. I finally made one this last week and uploaded it so anyone can use it. And here it is! 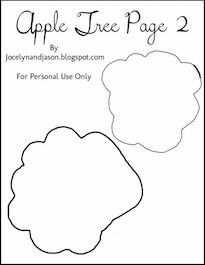 This free quiet book template includes (and yes, this list is to help google find this post): a lion quiet book page template, a barn quiet book page template, farm animal finger puppets template, an apple tree quiet book page template, a dinosaur quiet book page template, a car quiet book page template, a ladybug quiet book page template, a flower quiet book page template, a Mr. 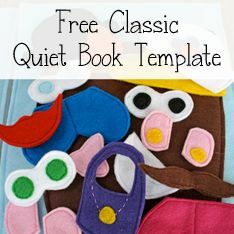 Potato Head quiet book page template (with accessories! 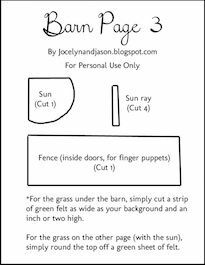 ), and a weaving quiet book page template. So there you go! Enjoy! 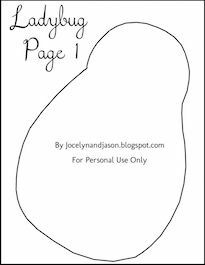 I've been wanting to make a quiet book but I'm not sure what to use for the pages themselves. For my own backgrounds, I just used a full sheet of felt for each page. It worked great! Hi Jocelyn. 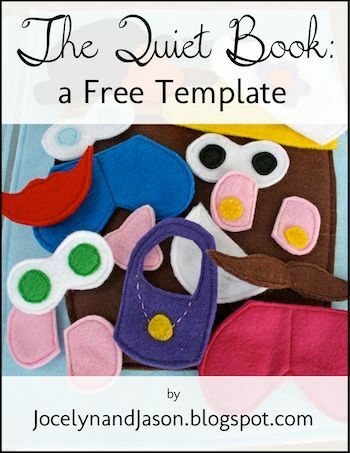 I am thinking about making your quiet book but was wondering how many pieces of felt you probably used in total? 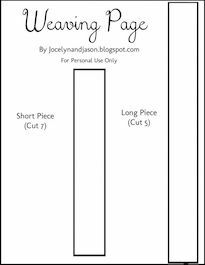 Thank you so much for switching the templates to an easy download! I really appreciate it! Yeah, no problem! I had no idea scribd was trying to charge for them. Thanks for letting me know! So awesome, thank you! 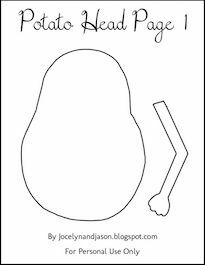 I don't have a drawing bone in my body, this is so helpful. A MILLION thanks! how cool!!! 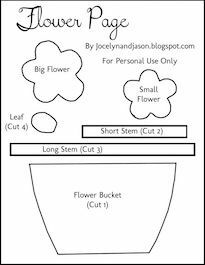 I've been wanting to make one, but had no clue where to start this is awesome!!! Thank you so much! I love your mr. potato head pages. I have taken them and glued them into the inside of those thin baby wipes case. I now keep that in my purse for whenever my son or daughter needs a distraction while waiting. 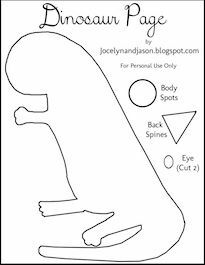 These templates are perfect! 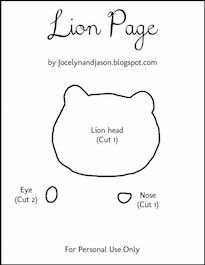 I'm going to make this for my 2.5 year old and am so excited. Thank you so much for the free template. Is the binding just a sewed button hole and more strips of felt for the ties? Yes, kind of. :) It's sewed button holes, and then I originally used a cut-up shoelace for the ties. Since then, I switched to metal binder rings to connect it, which I've found to work better. 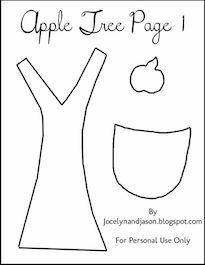 I seriously love your quiet book blog! 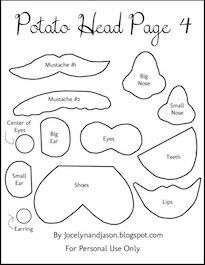 I just started a quiet book for my 1-year-old and I keep seeing the Mr. 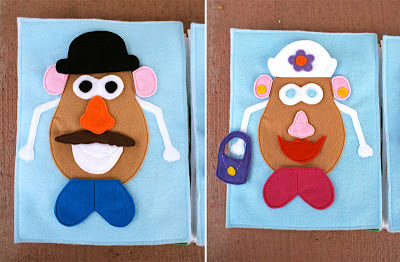 Potato Head page all over Pinterest...so excited that the pattern is here! Thanks a million! How awesome of you to share! Thank you! 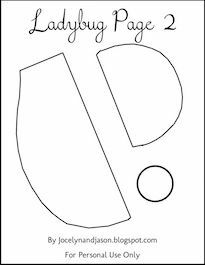 So I'm super excited to have completed your lion, barn, ladybug, flower, potato head, and weaving page as part of the thirty quiet pages that I have planned. I'm halfway there since I've finished some off of other blogs. I plan on featuring the ones I mentioned tomorrow on my site, which just started...about an hour ago! I'd love for you to come by and tell me what you think. I'll make sure to link back. Wow, that's awesome! I just saw your comment today; I'll definitely come check out your blog! Thank you so much! I LOVE all your pages!! Excited to get started on it for my son! 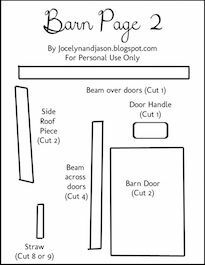 I'm making my first quiet book. 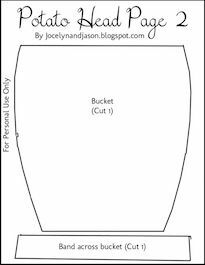 How do you cut out the shapes from the template? Felt is hard to draw on and I'm having trouble. 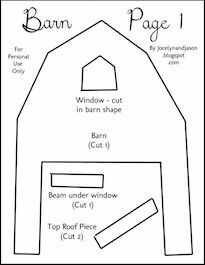 How I did it was print the templates on to sheets of paper, then cut the shapes out of the paper. Then I pinned the paper to the felt, and cut the felt out around the shape. Does that make sense? I too am making my first quiet book, looking forward to seeing how it turns out! 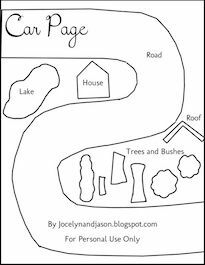 ;) thank you for sharing & putting out a easy to use page! I am a bit confused on how things 'stick' / stay on the dino & the potato heads. Do I need to velcro the pieces or will they just stick to the felt body? thanks! 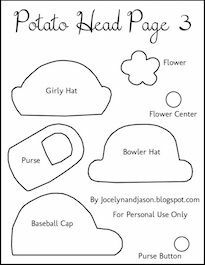 I got my felt at the craft stores closest to me - Joann's Fabrics, Michael's, and Hobby Lobby. I just got the regular 9"x12" felt sheets (they have lots of colors and cost about 30 cents each), and they worked great for me! I tried to post , but here it is again. Thank you for the Templates. I completed a few pages and will try to send them to you (from my Yahoo account.) My youngest enjoys them and they are a great stress release for me. 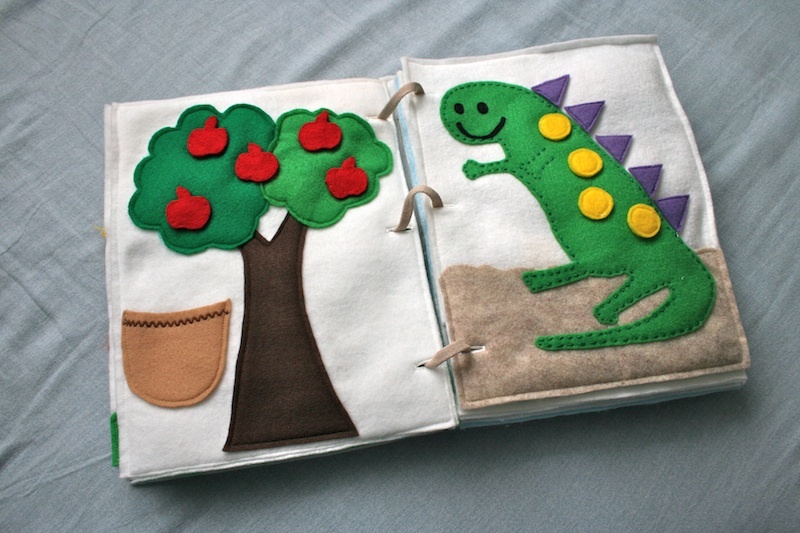 I am hand sewing most pages and find that the different designs are fun. Thanks so much. 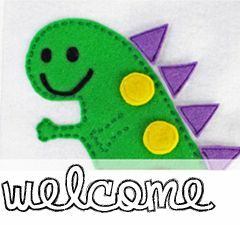 Renee L.
Thank you so much for the free templates! I am so excited to use them, I just have to figure out how to sew now. 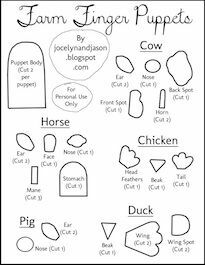 Thank you so much for these free templates. I've been wanting to make this since ages :D I will soon execute this book :) thanks again! Thank you so much for the free templates! 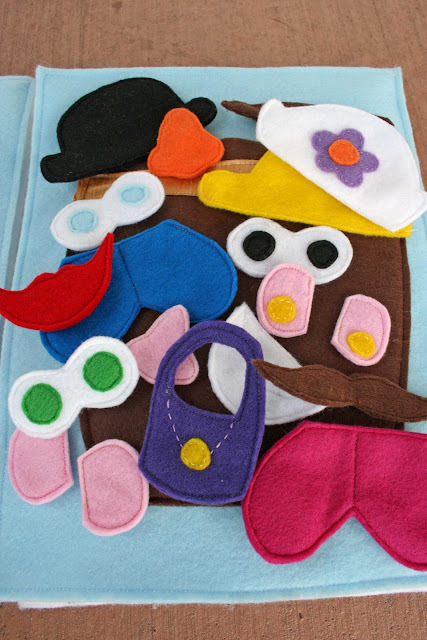 I'm excited to make the potato head page, and I was wondering if you used velcro to get the face cut outs to stick or just let them stick to the felt? thanks for the templates as I'm not good at drwaing, it will help me. 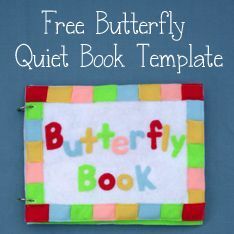 Does anyone SELL quiet books? So hard to find them in the U.S.